January 16-20th is traditionally the coldest time of year in Wisconsin. This time of year can be chilly and glum, soYou Move Me, Strategic Partners Marketing and Rosie’s Café have pulled together to make this time a little warmer with a simple act of kindness, all to benefit Briarpatch! Please join in this warming community moment as we Warm up on the Coldest Day of the Year! With Rosie’s Café and You Move Me, to benefit the youth shelter at Briarpatch! 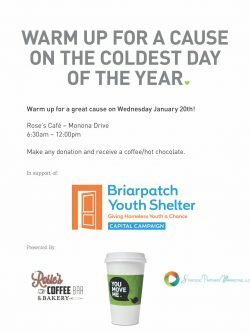 Come in to Rosie’s café on Monona Drive Wednesday January 20th from 6:30a – 12 noon and make a donation in exchange for a warm coffee or hot chocolate! It’s that easy. You make a monetary donation, you get a drink in exchange, and all donations go to Briarpatch. Where will I sleep tonight? Today in Dane County, approximately 300 homeless youth will ask this question, however, the recently opened overnight youth shelter at Briarpatch is providing a warm and safe place for some of those teens to stay. Since 1971, Briarpatch Youth Services has been the primary resource for at-risk youth and their families in Dane County. And now, they are taking a big step forward to help these youth even more, by opening the first-ever facility in Dane County dedicated to providing temporary shelter to homeless youth ages 13-17. The whole community is invited to participate. 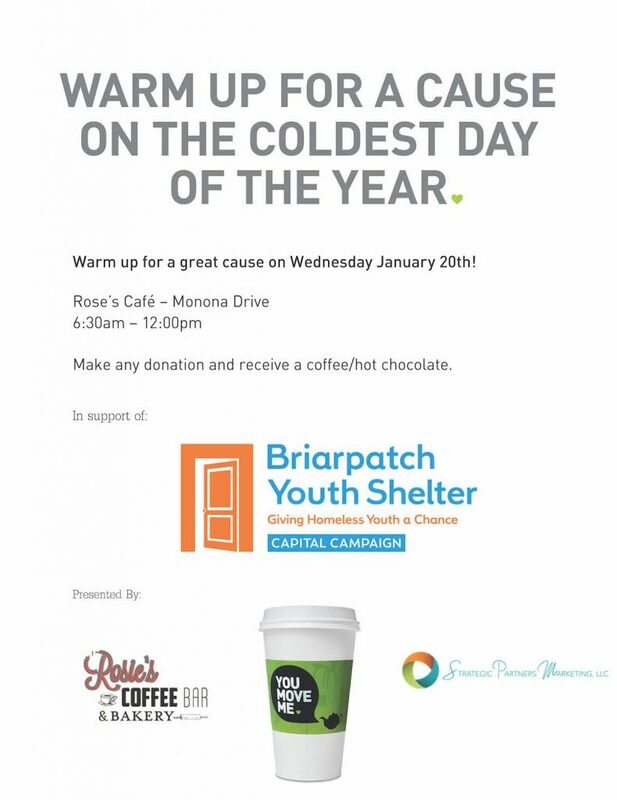 Come warm up on the Coldest Day of the Year on Wednesday January 20th at Rosie’s Café in Monona. Enjoy a warm drink and know that whatever amount you can give is appreciated and will help provide warm and safe shelter for homeless teens!